While the marketing and sales plans may have changed, the STX Surgeon RX3 stick still features innovative technology such as the PureGrip shaft design, PureBlade carbon fibers, Precision Flex II flex profile, and more. But are these design elements enough to make this stick worthy of your money? Find out more in our full STX Surgeon RX3 stick review. Before diving into the performance, let’s go over the technology that makes up the RX3 Stick. Perhaps the most unique feature of the stick is the PureGrip shaft design which features an ergonomic U-shaped design on the underside of the shaft which helps to fill the void in your hand that can be found with more traditional shaft designs. Sticking with the shaft, the RX3 uses a Precision Flex II flex profile which STX claims is the most versatile dual-kick stick on the market. They’ve done this by optimizing the lower hosel for a faster release. Meanwhile, the upper portion maximizes load for more powerful and hard shots. Moving into the blade we’ll find the PureBlade tech where STX has seamlessly woven together high performance carbon fibers for advanced performance. To enhance puck feel they’ve used 3k carbon fiber on the front of the blade, on the back, however, they’ve used 18k in order to reduce weight. A proprietary resin called Silver Streak has also been injected along the base of the blade to help increase durability. Finally, STX applied their Sand Grit texture to the blade to increase friction and help maximize puck responsiveness. So now that we’ve examined what makes up the stick, a simple question remains. Do the innovative and fresh technologies translate into a great elite level stick? We were fortunate enough to receive a demo RX3 stick from STX to put through the paces and came away pleased, but not blown away, with what it had to offer. When first picking up the stick, it feels nice in the hands but isn’t the lightest stick on the market. After several years of weight not being on the forefront of players minds, mostly because all sticks were in the 425 gram range, it has become a hot topic once again. Companies like Bauer and now Warrior are unveiling new sticks weighing less than 400 grams, and setting that as the new standard. STX has met the standard at 425 grams, but additional weight reduction would help take this stick to the next level. The shaft design of the RX3 is obviously a big deal on paper, but beauty is in the eye of the beholder. I can’t say that the ergonomic design made me a better stickhandler, shooter, passer, or better at hockey in any way, but I’m also not sure that’s the intent. Filling that negative space in your hands is more of a comfort thing than anything else, at least to me. To some players, I’m sure the new design is great and makes a noticeable difference out on the rink. For me, it was neither a great feature nor a drawback. It felt fine in my hands, but more unnoticable than game changing and not something I can say that is a must have on a stick. When it comes to shot performance, the STX Surgeon RX3 stick performed about as expected. Wristers were clean and quick, with some decent zip on them, while slapshots felt hard with a strong release. I had a bit of trouble with accuracy using the RX3, but I attribute that more to the curve I was using rather than the stick itself. Speaking of curves, there are only three blade patterns to choose from with the RX3. Two of them are mid-toe curves, and the other is a mid. I chose the X28 which is a mid-toe curve with advanced open face. Despite it being highlighted for extreme preciison and accuracy on the site, I did not find it work well in that regard. In hindsight, choosing one of the other blades would have performed a bit better for my game. The big question at the end of all this is should I buy this stick? Perhaps the easiest way to answer that question is by looking at the price tag. STX made a dramatic shift in their gear offerings with this release, making products available on their own website rather than through a collection of dealers. This allowed them to lower prices dramatically, and the senior size RX3 currently costs only $174.99. Not only does this give you a great stick at an awesome price, but you also receive a 14 day risk free trial, money back guarantee, and free shpping on your purchase. It’s pretty much a no brainer then that if you’re eyeing the RX3, it’s worth a shot. To pick up your own STX Surgeon RX3 stick, head over to STX.com or click here. 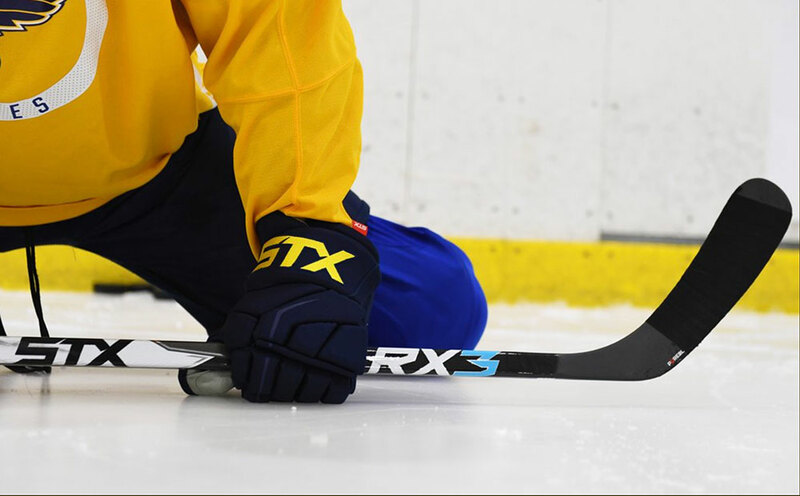 If you’ve used the RX3, leave us a note in the comments below and let us know what you thought of the stick!